Ministry of External Affairs 2018 Jobs Notification. 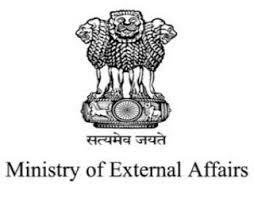 Ministry of External Affairs is inviting applications for the positions of Under Secretary. Interested and Eligible candidates can apply for the positions. Appointment for filling up the post of Under Secretary with specialization in Hindi on deputation basis in Ministry of External Affairs. 3. Educational Qualifications: i. Master's degree of a recognised University or equivalent in Hindi with English as a subject at degree level [OR] ii. Master's degree of a recognised University or equivalent in English with Hindi as a subject at degree level [OR] iii. Master's degree of a recognised University or equivalent in any subject with Hindi and English as subjects at degree level. 3. Experience: i. Six years experience of terminological work in Hindi and/or translation work from English to Hindi or vice-versa, preferably of technical or scientific literature. [OR] ii. Six years experience Of teaching, research, writing or journalism in Hindi. 5. Job Description: To work in a certain specialized Division at MEA Headquarters, New Delhi. 6. Period of Deputation: Initially for three years; could be extended as per extant rules prescribed by DoPT on the subject. A Up-to-date copies of ACRs/APARs for the last five years duly attested on each page by a Group A Officer. Completed application should be sent through proper channel in the prescribed proforma to Joint Secretary (Administration), Room No. 149 C, South Block, Ministry of External Affairs, New Delhi.Applications of willing and eligible officers may be forwarded to the undersigned latest by September 15. 2018. Cadre Controlling Authorities are requested that the applications of Only those Officers are forwarded who can be spared on being selected.